(Nanowerk Spotlight) Poisson's ratio describes the fundamental elasticity of any solid. Conventional materials contract laterally when stretched and Poisson's ratio expresses the ratio of transverse contraction strain to longitudinal extension strain in the direction of stretching force. This means when a material is enlarged in one dimension, it shrinks in the other two dimensions, and vice versa. Virtually all common materials – think rubber band – become narrower in cross section when they are stretched; they have a positive Poisson's ratio. Poisson's ratio has been a basic principle of engineering for more than 200 years as it allows engineers to identify how much a material can be compressed and stretched and how much pressure it will withstand, before it collapses. In contrast, materials with a negative Poisson's ratio expand laterally (get fatter) when stretched (read more: "The building blocks of the future defy logic"). Take wine bottle corks for example: Corks have a near-zero but positive Poisson's ratio, which makes them difficult to insert but easy to remove. The opposite would be true if the cork had a negative Poisson's ratio. Materials with a negative Poisson's ratio are relatively rare and it has recently become popular in referring to them as metamaterials – a group of materials that attain interesting or extreme properties via structure rather than composition. A recent article in Advanced Materials ("Negative Poisson’s Ratio in Modern Functional Materials") reviews recent progress in materials with a negative Poisson's ratio with the current state of research regarding both theory and experiment. 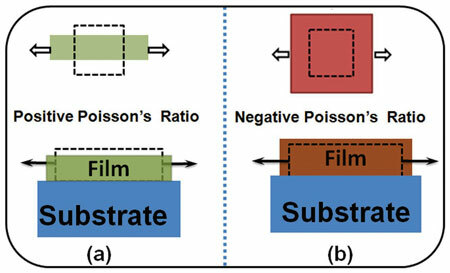 The authors, Chuanwei Huang and Lang Chen, address the inter-relationship between the underlying structure and a negative Poisson's ratio in functional materials, including macroscopic bulk, low-dimensional nanoscale particles, films, sheets, or tubes. They also address the coexistence and correlations with other negative indexes (such as negative compressibility and negative thermal expansion). 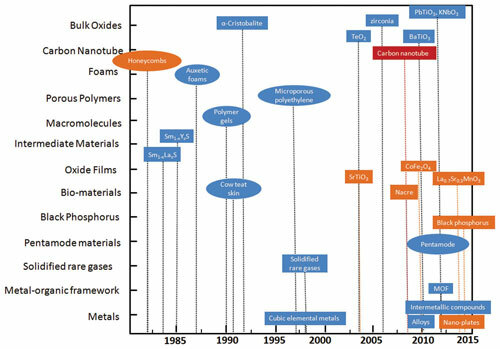 Concluding their review, they propose open questions and future research opportunities for functional materials with negative Poisson’s ratios. 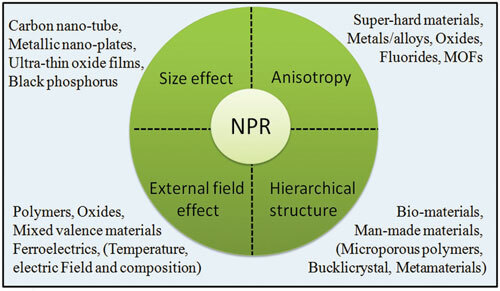 What makes these materials so interesting for researchers is that, compared with conventional materials that have positive Poisson’'s ratios, materials with unusual negative mechanical indexes possess enhanced physical properties, which result in a number of promising applications in various fields, particularly in aerospace, biomedicine, defense, and smart or intelligent systems. Many mechanical properties in materials with negative Poisson's ratios – mainly including shear resistance, indentation resistance and fracture toughness – can be significantly improved, and have been representatively used as vanes for aircraft gas-turbine engines. 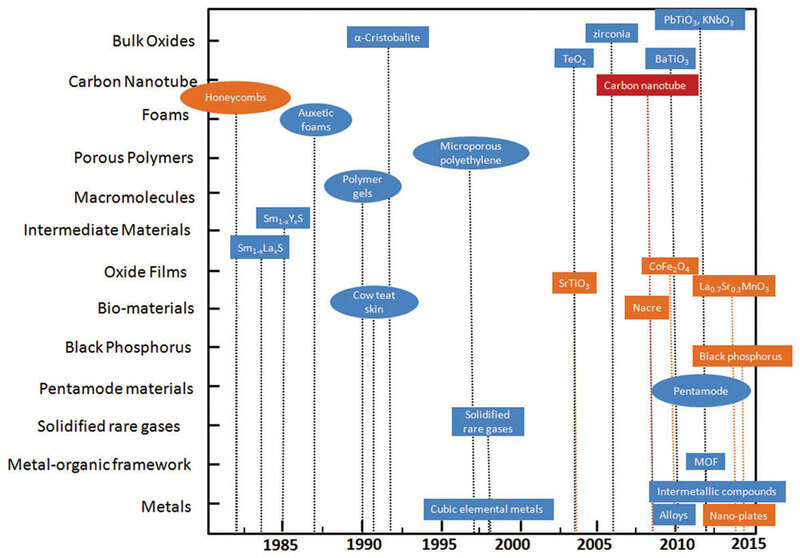 The authors point out that, so far, enormous progress has been made in realizing a negative Poisson’s ratio in various advanced materials, such as organic materials, mixed-valence materials, oxides, low-dimensional films, and man-made materials ranging from the macroscopic level (honeycombs, foams, ceramics, composites, or others) down to the microscopic level (microporous polymers, molecular auxetics, and low-dimensional materials). They write that, "although the concept of a negative Poisson’s ratio has been known for a long time, it was thought that this property was a rare phenomenon in the early development of this field. By steady effort, the discovery of materials with a negative Poisson’s ratio has increased markedly, and it is now recognized that a negative Poisson’s ratio may be more common than previously thought. Recent developments in fabrication techniques have further advanced our ability to desirably manipulate the structure of materials, which opens the door for modulating the magnitude of the Poisson’s ratio from positive to negative." The authors summarize the multiple ways to tune and control desired Poisson’s ratios based on the correlations among the negative Poisson’s ratio, internal structures, and external effects. As plotted in the figure below, the internal factors, such as anisotropy and microstructure/hierarchical substructure, and external fields, such as chemical doping, temperature, pressure, or electric field, could dramatically affect the magnitude and sign of a Poisson’s ratio. Concluding, the authors write that, as a frontier of materials science, the field of the negative mechanical index is progressing at a very fast pace. "The unresolved issues and challenges discussed above can offer great opportunities for future study. Although the materials with negative Poisson’s ratios reviewed here are only a small part, it is believed that negative index materials are on the threshold of applications, which could deepen our understanding of the negative properties of materials."